John was born in Arlington Heights, Illinois and at an early age moved to Boston, Massachusetts and graduated from Wellesley Senior High School. Upon graduation, John first attended Michigan State University in East Lansing, Michigan and then transferred to The University of Massachusetts at Amherst. In 1985 John completed the Bachelor of Arts in Theater and headed to The Ohio State University to earn a Master of Fine Arts degree, which he completed in 1988. While at OSU, John did additional coursework at the Advanced Center for Computer Art and Design and was inspired by teacher and artist Charles Csuri, one of the pioneers in Computer Graphic Art. After graduation John worked as a freelance theater artist in North Carolina and Louisville, KY. In 1991 John was hired as the first Director of Student Computing at Indiana University Southeast. Additionally, John was an adjunct faculty in Theater at IUS from 1990-1997, and in 1995-1996 was the Associate Director of the Apprentice Company at Actor’s Theater of Louisville. In 1997 John joined the faculty at Purdue University in the Computer Graphics Technology Department and became the Director of the CGT program at the South Bend, Indiana location. John returned to the New Albany area in 2005. 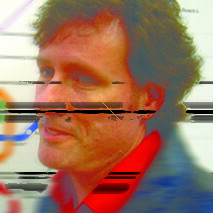 Today, John is an Associate Professor in the Department of Computer Graphics Technology for Purdue College of Technology in New Albany, Indiana. His current teaching interests are in design and visual communications, computer illustration, digital photography, and digital lighting and rendering. John continues to be an active practicing theater artist in the area, working with IU Southeast Theater and The Bunbury Repertory Theatre in Louisville, Kentucky. John is a member of the Association for Computing Machinery’s Special Interest Group on Computer Graphics and Interactive Techniques (ACM SIGGRAPH). John was the SIGGRAPH 2006 Conference Chair and served the conference and executive committee of ACM SIGGRAPH from 1998-2008 in various capacities. John has shown his work nationally and internationally, most recently in Seoul, South Korea.